Farmer adoption of sustainable agricultural practices is key to sustainable development, as changes at the farm level are essential to ensuring food security and environmental protection. Reasons for converting to sustainable farming have been studied in a number of instances. However, the underlying rationale that motivates this behaviour is not always made clear. 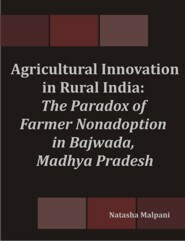 The village of Bajwada in Madhya Pradesh is used as a case to investigate farmer perceptions and attitudes regarding sustainable farming. An innovator has been promoting what seems to be a highly productive and lauded method of sustainable farming called Natu-eco farming for the past five years. Strikingly, this technique has had practically zero adoption in the village. This study aims to examine this paradox by exploring farmer narratives about sustainability, futures and development. Semi-structured interviews were conducted using 18 farmers in Bajwada. Participatory observation was also undertaken for ten days. The development discourse, the drive for modernity and urbanization were found to be important in shaping farmer’s perspectives on Natu-eco farming and sustainable agriculture. An understanding of the dominance of certain discourses and narratives offers a new approach to understanding farmer adoption and non-adoption. The results of this study are meant to attract the attention of policymakers and practitioners who are involved in the planning and implementation of schemes and projects promoting sustainable agricultural innovation. Natasha Malpani has a strong interest in sustainability and social enterprise. Having obtained a M.Sc. in Immunology from the University of Oxford, and a M.Phil. in Environment and Development from the University of Cambridge, she is keen to apply her background in health and environment to the markets. She runs an award-winning social enterprise known as GreenCycle that promotes the re-use and recycling of cycles. She has had her writing published in prominent Indian newspapers and magazines.